Australian Spa Covers is an Australian owned company. Based in Victoria, they have been manufacturing spa covers for over a decade. Our quest for quality and innovation in product and manufacturing has continually positioned Australian Spa Cover as a market leader. Their spa covers and accessories have long been preferred by the majority of spa manufacturers and retailers on a national scale. They design and manufacture the toughest spa covers with the best weight bearing capacity in Australia. 24 month limited manufacturers warranty is delivered with every spa cover purchase. 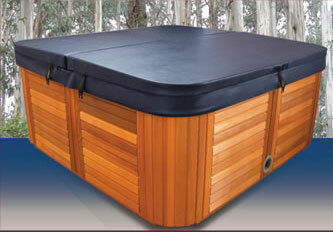 Australian Spa covers are purpose designed and manufactured to withstand the harshest of Australian climate conditions. Our special protective UV stabilising compounds help in preventing direct sunlight degradation. All Spa Covers have a unique anti-bacterial treatment agent which adds further protection against fungal attack. Visit Australian Spa Covers on the web. To place an order simply call us or email us with your make and model of spa (if known) and the colour you would prefer. Colours can be seen on theAustralian Spa Covers website. The most common colour is the Outback Tan which matches the Western Red Cedar cabinets. If you are unsure of the make and model of your spa we need the shape and dimensions of the spa. If it has rounded corners we will need the radius of the corners or a tracing of the corner will suffice. Covers are made on demand and usually take 3 weeks from date of order. The Pool Clinic carries a wide range of products from many manufacturers. We can also source any products that may not be in stock.